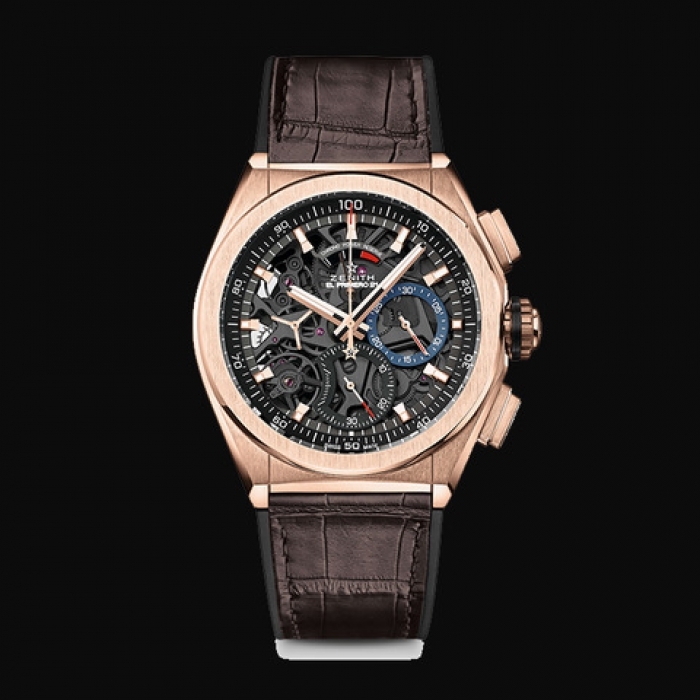 Zenith | 26'200 € Tax inc.
Zenith stunned the world in 2017 with the grand release of the new Zenith DEFY EL PRIMERO 21. A chronometric reinvention of accuracy and reliability, the DEFY EL PRIMERO 21 is the ultimate embodiment of the spirit of innovation that has coursed through Zenith’s blood for the past 150 years. The warm glow and precious refinement of rose gold gently accentuate the inherent nobility of this trailblazing model. 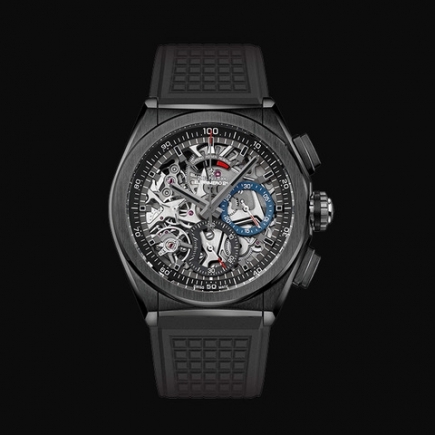 The Zenith DEFY EL PRIMERO 21 represents a quantum leap in both performance and mechanical design. This is a competition against no-one but itself. The newly upgraded movement of this outstanding timepiece boasts a frequency of 360,000 A/H (50 Hz), ten times that of its world-famous El Primero predecessor, enabling 1/100th of a second precision. 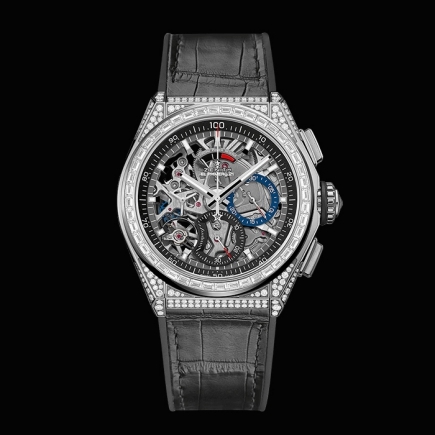 An exquisitely designed display magnifies the effect of this astonishing frequency: the inner bezel bears a scale graduated from 1 to 100 around which a 1/100th of a second hand sweeps at a lightning speed of one turn per second, offering unprecedented visual impact and a surreal time-travelling experience for the lucky wearer. Echoing the trend in modern engineering development and ensuring optimal performance, this incredible mechanical complication is achieved using a far smaller number of components, minimizing tedious assembly and adjustments. In addition to significantly improved performance and mechanical structure, the design of the TIME LAB-chronometer certified DEFY EL PRIMERO 21 draws inspiration from the rugged good looks of its 1969 predecessor. Framed by a 44 mm case made of grade 5 titanium, the openworked dial of the DEFY EL PRIMERO 21 offers a resolutely contemporary background for the key identifying characteristics of the legendary original: a star-tipped sweep-seconds hand, large luminescent baton-type hands and facetted hour-markers all paying proud tribute in a stunning demonstration of futuristic brilliance. Perfectly complementing its rich inner workings, the case of the TIMELAB chronometer-certified DEFY EL PRIMERO 21 ROSE GOLD appears in this glowing precious metal. Matching gold-plated hour-markers and hands sweep elegantly around a lustrous black openworked dial featuring a chronograph power-reserve indication at 12 o'clock, hours and minutes in the centre, small seconds at 9 o'clock, black 60-second counter at 6 o'clock and distinctive blue 30-minute counter at 3 o'clock. This stunningly elegant model comes with a choice of a black rubber strap coated with brown alligator leather or a truly piece de resistance model with a rich rose gold bracelet, both with a gold and titanium double folding clasp. This magnificent timepiece, endowed with a generous 50-hour power reserve and water-resistant to 100 metres, is bound to catch the attention of refined and demanding watch enthusiasts.